The Egyptian Ministry of Antiquities has been going hard on the archaeological discoveries this year, but are we tired of it? No, no we are not. Especially when they come up with spectacular finds like this one. In a tomb in the El-Assasif necropolis in the ancient city of Thebes, two wooden coffins have been found in perfect condition, with their mummies still inside. 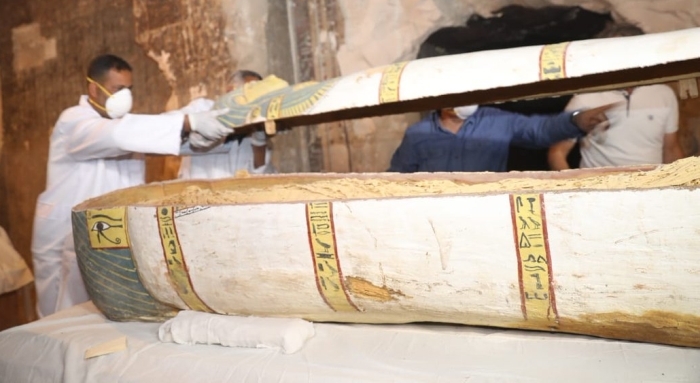 "One sarcophagus was rishi (feathered) style, which dates back to the 17th dynasty, while the other sarcophagus was from the 18th dynasty," said Minister of Antiquities Khaled Al Anani. The 17th dynasty dates between approximately 1580 to 1550 BCE, and the 18th ran from around 1550 to 1292 BCE. Who was buried in the rishi coffin is unclear, but the other coffin, made of wood and painted plaster, contained the body of a woman named Pou-you, reports the Institut Français d'Archéologie Orientale, which collaborated on the excavation. Both were found in a tomb labelled TT33. A third coffin, black and intricately decorated in bright gold, was found in a second tomb labelled TT28. It belonged to a man named Thaw Inkhetif, who was the overseer of the mummification process at the temple of the primal goddess Mut, the World Mother. Thaw Inkhetif's tomb was elaborate, with a mural in bright colours painted on the ceiling, five masks and around 1,000 ushabti figurines, small statuettes buried with important people to serve them in the afterlife. The tomb TT33 contained a group of several other mummies, too - possibly of a family that had been buried together. These hadn't been interred in coffins, and were possibly from an earlier burial some 4,000 years ago. Both tombs have been known about for some time, and have been previously partially excavated, but sections had been blocked by rubble. Archaeologists had spent five months clearing some 300 metres (984 feet) of debris before they could access TT28, according to The Telegraph. Excavation work on both tombs, as well as analysis of their contents, continues.